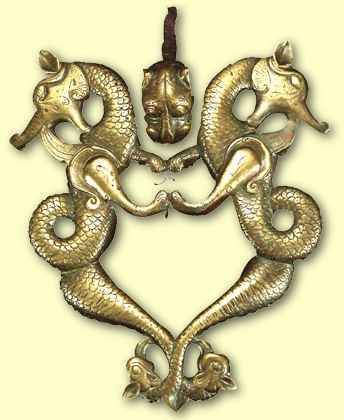 is in a place, between the truth and wrong"
One of the most remarkable examples of the Anatolian Medieval Islamic metal works is the bronze cast door-knockers from the Cizre2-Great Mosque, that are in the form of a dragon. In accordance with the inscriptions, the mosque was built by the Musul Atabegs in 1155-11603. The door-knockers on the double winged doors, each of dimension 3.00 x 1.12 m. have attracted attention of many researchers4. Furthermore, the origin of the dragon figure5, its iconography and usage in the Anatolian Seljuk period have also been subjected to various analogical studies6. The existence of the door-knockers was first detailed by a sketch and photograph taken by C. Preusser in 19107 (Fig.1), which shows the door-knockers in-situ. The door-knockers were detailed in a dozentur thesis completed in 19668 and had been studied many times after that date9. In 1964, it was proposed to take the door-knockers to a museum in order to prevent them from being stolen. However, the door-knockers remained on the door until December 1969, when it was discovered that one had been stolen. Following the theft, the other knocker and the head of the lion remaining on the door, were taken to the officers of the Association for Protecting of the Ancient Monuments by the Cizre provincial district's governorship, in order to prevent them too from being stolen. The stolen knocker was discovered in the Copenhagen-David Collection (Inv.No:38/1973)10 (Fig.2) in 1973. Following this discovery, the remaining knocker and lion head were initially taken from the Association to Mardin Museum. In 1976 they were then delivered to the Museum of Turkish and Islamic Arts-Istanbul (Inv.No.3749)11. The knockers are of dimension 27 x 24 x 3cm and show a sustaining composition formed by the double dragon figure, placed either side of a lion head (Fig.3). Researchers date their age to either the second half of 12th century12 when the mosque was built or the 13th century together with the wooden door13. The lion head acts as a hinge and connects the knocker to the door. The two wide open mouthed dragons are connected either side of the lion head and face away from each other. The bodies of the figures, cast in the profile, form a false knot by turning around in the middle and their tails terminate with eagle heads. The eagle heads have wide eyes and sharp ears, and their beaks pointed upward. The dragons have ornamental style rūmis where their heads connect to the rest of the body. The effect of the scaled, snake like body is produced by scraping. The two dragons, each with two legs, are connected to each other with adjacent legs. Each dragon has wings, initiating from the joint of the leg which curl into the open mouth of the dragon. The dragon heads are cast in profile with sharp ears and almond-shaped eyes. The lion head is cast in façade, with a long face, sharp ears, long nose, wide eyes, plump cheeks and a wide-smiling mouth. 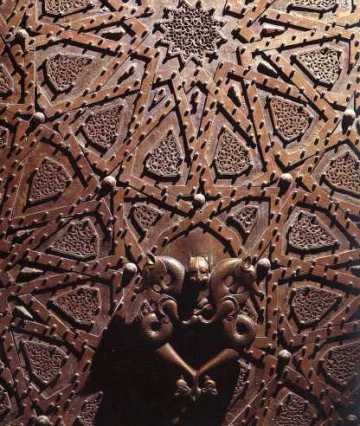 A similar knocker is exhibited in the Museum of Islamic Art, Berlin (Inv.No. 1.2242)14 (Fig.4). 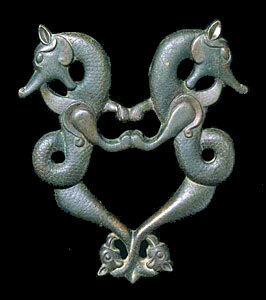 According to early literature15, the dragon figured knocker was bought in Tbilisi on behalf of Berlin Museums in 1912. However, later publications16 claim that it originated from south-east Anatolia/North Mesopotamia. Even though this knocker is of similar dimension (27, 5 x 24 cm) to the Cizre examples and also bronze cast, there are some differences in the detailing as a result of the differences in the workmanship. 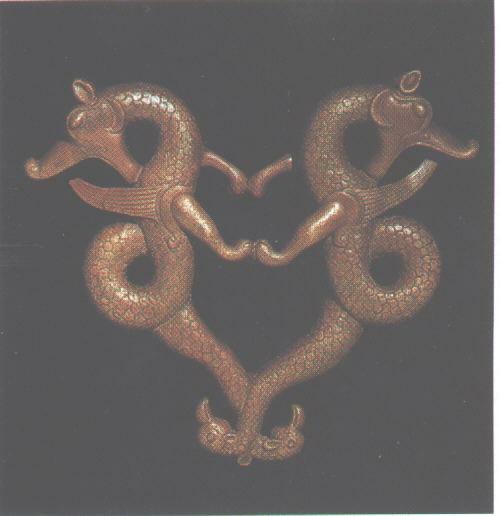 The eyes of Cizre dragons were made by embossing, which fills the eye ditch. Whereas on the Berlin example, the eye pupils were detailed using shallower workmanship; the lines detailing the mane between the neck and body are plain compared to the more ornamental style of the rūmis. These same lines detail the head and chin. The area between the body and neck are detailed using linear scrapings, compared to the scales detailing the Cizre examples. The upper chins on the Berlin example are slightly longer. However, the ears are not as pronounced. The workmanship on the wings of the two examples are different. On the Berlin example, the legs connecting the dragons in the middle are detailed using wavy lines. The lion head between two dragons is also different to the Cizre example. Like the Cizre door-knockers, the double dragon form is connected to the lion head which is used as a hinge in the middle. This form is part of a thematic program that was prominent in the south-east Anatolian region during the 12th – 13th centuries17. This form is also seen in the manuscript of "al-jāmi‘ bayn al-‘ilm wa al-‘amal al-nāfı‘ fi al-sinā‘at al-hiyal" written by Abū al-‛izz ibn Isma‛īl ibn al-Razzāz al-Jazarī for the Artuqid Palace in Āmid (Diyarbakır) in 1206. Other artifacts from the palace during this period such as clocks, human and animal shaped toys, automatic jug and pools, water equipment, alarm clock, protractor and other mechanical tools are also detailed with this form. Other items from this time displaying this form include a large "brass cast" door, the locks and door bolts18. The similarity between the monumental double winged door bronze cast door-knocker's (Fig.5) and the examples from Cizre and Berlin is striking19. Each of the bronze cast doors is 3.50 x 1.20 m (18 hand spans high and 6 hand spans wide in the original text). All three examples exhibit the double dragon form with its body knotted. However this example differs slightly to the Cizre and Berlin examples, with mouths of the dragons is facing inward, symbolically catching the lion head20. Furthermore, one can establish similarities between the draft and construction details of the door21 (Fig.6) which al-Jazarī designed for the Artuqid Palace and praised as "it is a real masterpiece, a real pearl" with his own words and the door of Great Mosque. 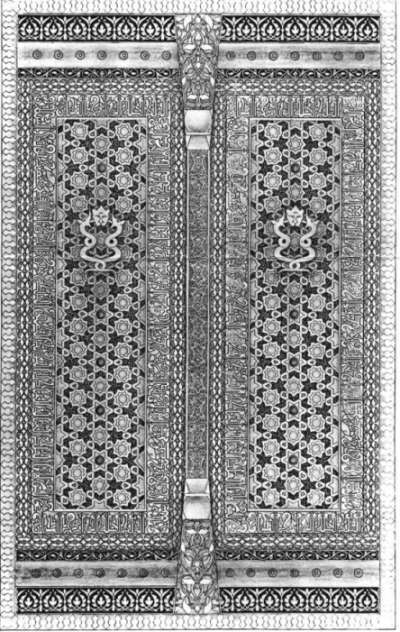 In fact, it is not known whether the door was made or not; but it is interesting to note that much of the detail al-Jazarī mentions on the door of Great Mosque is the same as metal detailing on the brass cast door. 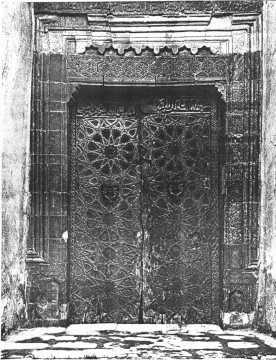 A photograph taken in 1910 shows the double winged doors at the main entrance to the Great Mosque. Even though the knockers were stolen in 1969, the doors remained at the main entrance. In 1972, they were discovered leaning on the wall near the western entrance of the north section of Great Mosque Medrese. They were cleaned and locked in one of the rooms of the medrese22. At an unknown date, they were transferred to the Museum of Turkish and Islamic Arts23 (Inv.No.4282)(Fig.7). It is thought that the door was added during the restoration works to the Mosque in the 13th century. 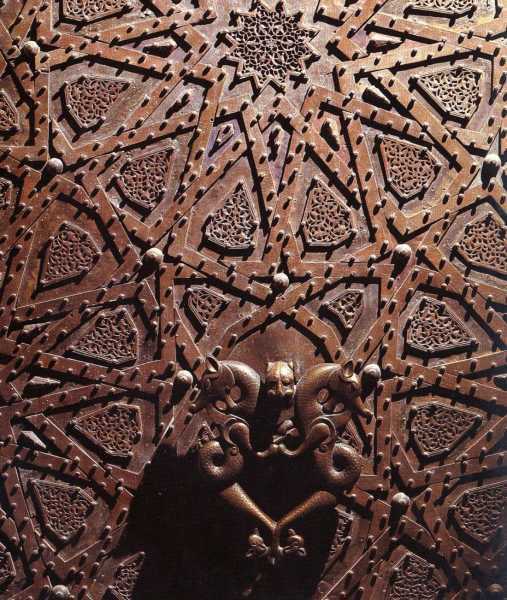 The door has a wooden skeleton and is covered like cage with dense geometric compositions formed with the wide bronze strips24; the embroided strips and bronze plates (ajour) and the ornamentation elements on the bordure were nailed to the door skeleton with the rounded head bronze nails (Fig.8). The doors feature inscriptions on the upper horizontal frames of both doors25. The inscriptions are bronze cast and are in the thuluth style. The inscription "Azze li-Mavlānā al-Sultan al-Malik a "is featured on the right-hand side and "(d-dūr? Abū'l Kasım Mahmūd Sanjar Shāh" on the left26. It is clear from the radiographic study that the door has been restored several different times in the past. Even if woods of the door and the coloured figural ornaments on it may belong to earlier dates31, some information in al-Jazarī and the inscription on the door lead us to the conclusion that the bronze covering geometric composition of the door of Great Mosque and the dragon shaped door-knockers belong to early of 13th century. Furthermore, it is believed that these knockers were made in a workshop in Diyarbakır region32. Although there were previously three examples of these dragon shaped door-knockers identified in literature, there may have been many more such door-knockers produced. In fact, two more examples are to be found in the Nasser David Khalili Collection (Fig.9)33, one of which was exhibited in Musée Rath, Genève in 1995 (Fig.10)34. It is clear that these knockers also originated from south-east Anatolia and also were made in the same workshop. It is hoped that with new information and data, the exact number and origin of door-knockers similar to the Cizre example produced can be established. BEDÎ‛ÛZ-ZAMÂN EBÛ'L-‛İZZ İSMÂ‛ÎL B.ER-REZZÂZ EL-CEZERÎ (2002), El-Câmi‛ Beyne'l-‛İlm ve'l-‛Amel en-Nâfi‛ Fî Es-Sınaâ‛ti'l-Hiyel, Çeviri, İnceleme ve Teknik Açıklamalar: S.Tekeli-M.Dosay-Y.Unat, Ankara. 2002. BİLİCİ, K (1993), "Cizre Ulu Camisi Kapı Tokmaklarının İkonografik ve Kronolojik Değeri Üzerine Bir Etüt", Sanat Tarihinde İkonografik Araştırmalar, Güner İnal'a Armağan, Ankara. 1993, pp.73-86. CAHEN, C (1953), "XIII.Asır Ortalarında Cezire (İzzeddin B.Şeddada Göre)", (Çev:N.Çağatay), İlahiyat Fakültes i Dergisi, Vol.2, Nr.IV, Ankara. 1953, pp., 93-106. CHARBONNIER, J.M (1995), "Les Visions Magiques de Nasser Khalili", Beaux Arts Magazine, No: 136, Paris. 1995, pp.50-51. De VISSER, M.W (1913), The Dragon in China and Japan, Amsterdam. 1913. DIEZ, E (1946), Türk Sanatı, Başlangıcından Günümüze Kadar, (Çev:O.Aslanapa), İstanbul. 1946. DIEZ, E; ASLANAPA, O (1955), Türk Sanatı, İstanbul. 1955. ERGİNSOY, Ü (1978), İslâm Maden Sanatının Gelişmesi (Başlangıcından Anadolu Selçuklularının Sonuna Kadar), İstanbul. 1978. ESİN, E (1970), "Evren (Selçuklu San'atı Evren Tasvîrinin Türk İkonografisinde Menşe'leri)", Selçuklu Araştırmaları Dergisi, I, Ankara. 1970, pp.161-182. ESİN, E (1972), "Ötüken İllerinde M.S.Sekizinci ve Dokuzuncu Yüzyıllarda Türk Âbidelerinde San'atkâr Adları", Türk Kültürü El-Kitabı, C:II, Kıs: Ia, İstanbul. 1972, pp.44-58. FEHÉRVÁRI, G- NASSAR, N (1998), Brasses, Bronze and Silver of the Islamic Lands, Vol.I-II, 1998. GEATINGS, F (1989), "A Misunderstood Arabic Astrological Symbol", Journal of the Kuwait National Museum, Dar al-Athar al-Islamiyyah, No.21, 1989, pp., 10-18. GIERLICHS, J (1993), Drache-Phönix-Doppeladler, Fabelwesen in der Islamischen Kunst, Berlin. 1993. HARTNER, W (1938), "The Pseudoplanetary Nodes of the Moon's Orbit in Hindu and Islamic Iconographies", Ars Islamica, V, 1938, pp., 113-154. HILLENBRAND, C (1985), "The History of the Jazīra, 1100-1250: A Short Introduction", The Art of Syria and the Jazira 1100-1250, Ed.by.J.Raby, Oxford. 1985, pp., 9- 19. HOLMQVIST, W (1961), "Europe, Barbarian", Encyclopedia of World Art, Vol.V, London. 1961, pp.145-177. HOPKINS, L.C (1931), "The Dragon Terrestial and the Dragon Celestial, Astudy of the Lung and Ch'en", Royal Asiatic Society's Journal, 1931, pp.791-806. İNAL, G (1971), "Susuz Han'daki Ejderli Kabartmanın Asya Kültür Çevresi İçindeki Yeri", Sanat Tarihi Yıllığı, IV, İstanbul. 1971, pp.153-181. LECHLER, G (1937), "The Tree of Life in Indo-European and Islamic Cultures", Ars Islamica, IV , 1937, pp., 369-420. LOWICK, N (1985), "The Religious, The Royal and The Popular in The Figural Coinage of the Jazīra", The Art of Syria and the Jazira 1100-1250, Ed.by.J.Raby, Oxford. 1985, pp., 159-173. MADDISON, F (1985), "Al-Jazarī's Combination Lock: Two Contemporary Examples", The Art of Syria and the Jazira 1100-1250, Ed.by.J.Raby, Oxford. 1985, pp., 141-157. MEINECKE, M (1989), "Islamische Drachentüren-Zu Einer Neuer werbung des Museums für Islamische Kunst", Museums Journal 3, IV (1989), pp.54-58. NASSAR, N (1985), "Saljuq or Byzantine: Two Related styles of Jazīran Miniature painting" The Art of Syria and the Jazira 1100-1250, Ed.by.J.Raby, Oxford. 1985, pp., 85-98. ÖGEL, B (1971), Türk Mitolojisi, I.Cilt, Ankara. 1971. ÖNDER, M (1966), "Selçuklu Ejderleri", Türkiye Turing ve Otomobil Kurumu Belleteni, VIII-287, İstanbul. 1966, pp.2-4. ÖNDER, M (1976), "Yeni Bulunan Selçuklu Devri Ejder Figürleri", Kültür ve Sanat, IV, 1976, pp.12-16. ÖNEY, G (1966), Anadolu Selçuklularında Heykel-Figürlü Kabartma ve XIV-XV.Asırlarda Devamı, (Yayınlanmamış Doçentlik Tezi), Ankara. 1966. ÖNEY, G (1969), "Anadolu Selçuk Sanatında Ejder Figürleri", Belleten, XXXIII/130, Ankara. 1969, pp.171-192. PREUSSER, C (1911), Nordmesopotamische Baudenkmäler, Altchristlicher und Islamischer Zeit, Leipzig. 1911. SPENGLER, W.F-SAYLES, W.G (1992), Turkoman Figural Bronze Coins and Their Iconography, Wisconcin. 1992. The Mytology of All Races (1917), VI. Indian Mythology, Boston.1917. The Mytology of All Races (1918), VI. Iranian Mythology, Boston.1918. The Mytology of All Races (1927), IV. Finno-Ugric, Siberian Mythology, Boston.1927. TITLEY, N.M (1981), Dragons in Persian, Mughal and Turkish Art, London. 1981. TUĞRUL, B-SUNGUR, F-GÖRKEM, A-ÖLÇER, N (1987), "Cizre-Mardin Ulucami Kapısının Restorasyonunda Radyografi Tekniklerinin Kullanımı", II.Arkeometri Sonuçları Toplantısı, Ankara. 1987, pp., 105-117. TUNÇER, O (1981), "Cizre Ulu Camii ve Medresesi", Yıllık Araştırmalar Dergisi, III, Ankara.1981, pp., 95-136. Türk ve İslâm Eserleri Müzesi, İstanbul. 2002. WARD, R (1985), "Evidence for a School of Painting at the Artuqid Court", The Art of Syria and the Jazira 1100-1250, Ed.by.J.Raby, Oxford. 1985, pp., 69-83. WEIGERT, H (1961), "Demonology: Medieval Christian World", Encyclopedia of World Art, Vol. IV, London. 1961, pp., 323-327. WERNER, E.T.C (1932), Dictionary of Chinese Mythology, Shangai.1932. WILLIAMS, C.A.S (1960), Encyclopedia of Chinese Symbolism and Art Motives, New York. 1960. WITTKOVER, R (1938-39), "Eagle and Serpent, A Study in the Migration of Symbols", Journal of Warburg Institute of Art, II, 1938-39, pp., 293-325. YETKİN, Ş (1976), "Anadolu Selçuklu Devrinden Bir Madenî Eser", Sanat Tarihi Yıllığı, VI, İstanbul. 1976, pp., 207-214. Fig. 1- The door and the door-knockers of the Cizre-Great Mosque in 1910 (from C.Preusser). Fig. 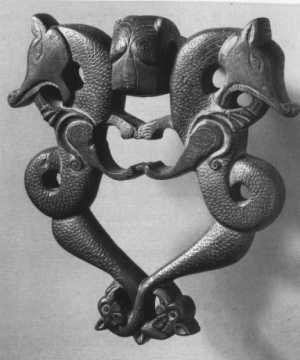 2- The door-knocker in the Copenhagen-David Collection (Inv.No:38/1973). Fig. 3- The door-knocker in the Museum of Turkish and Islamic Arts-Istanbul (Inv.No.3749). Fig. 4- The door-knocker in the Museum of Islamic Art, Berlin (Inv.No. 1.2242). Fig. 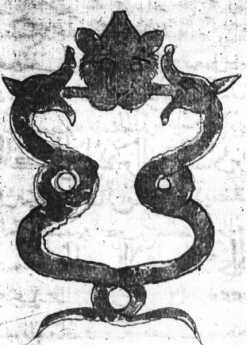 5- The door-knocker in al-Jazarī's manuscript. Fig. 6- An imaginative drawing of the door from Artuqid Palace in Amid (from Meinecke). Fig. 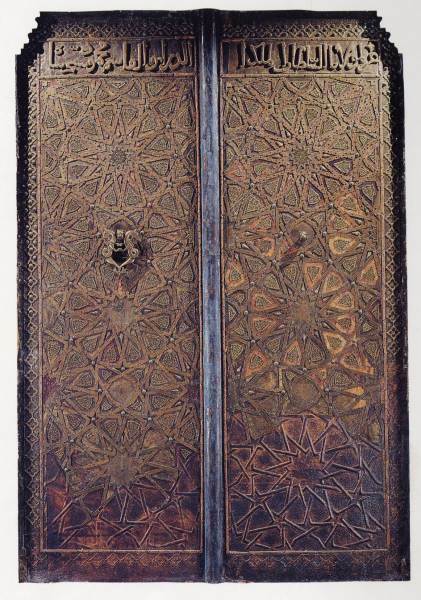 7- The door of the Cizre-Great Mosque in the Museum of Turkish and Islamic Arts-Istanbul (Inv.No.4282). Fig. 8- The detail of the door. Fig. 9- The door-knocker in the Nasser David Khalili Collection (from CHARBONNIER). Fig. 10- The another door-knocker in the Nasser David Khalili Collection (from FEHÉRVÁRI- NASSAR). I am most grateful to Chris Mahlen and Erçin Turhan for their unforgetable help in facilitating my work. 2 It is known that the name of the city is Jazīra ibn ‘Umar that is under the rule of Diyār-ı Rebia, one of three regions of al-Jazīra province in 13th century. See: CAHEN, C (1953), pp., 94-97. 3 TUNÇER, O (1981), pp., 102-105. 4 ÖNEY, G (1966), p.109; ÖNDER, M (1966), pp., 2-4; ÖNDER, M (1976), pp., 12-16; ERGİNSOY, Ü (1978), pp., 327-330, 440-443; BİLİCİ, K (1993), pp., 73-86. 5 In fact, the dragon is the continuing and a concrete expression of the snake cult which its roots extend the deep of the ancient times of the history and are the mythological factor in the creation of the universe and world. The dragon which has been subjected to the countless comments through the ages; sometimes, expresses the evil action and the hostile action against to the human being; sometimes, completely contrary to this, keeps the bad souls and enemies away and protects the human beings. On the other hand, it is an astrological reference to invisible eight and ninth planets known as the "Dragon's Head" and "Dragon's Tail" which accounted for the effects of the nodes of the moon's orbit (HARTNER, W (1938), pp., 120-122 ). The head of the dragon is sometimes referred to as al-Jawzahr and the tail as al-Nawbahr. See: GEATINGS, F (1989), pp., 10-18. It is so understood that this figure which is used as the amulet that provides the immortality, long life, happy life, fruitfulness and protects from the evil eyes comes into the historical scene light as the property of Asian cultural environment. Likewise, this fantastic creature that was used on a seal in Mohenjo-Dara (LECHLER, G (1937), Fig.51) and its history goes back to 3000 B.C. in accordance with our knowledge had won a mythological identity which affects deeply all Asian communities and had been subjected to the mythologies (De VISSER, M.W (1913), pp., 103-107; The Mytology of All Races (1918), pp., 264-265; WERNER, E.T.C (1932), pp., 284-285; The Mytology of All Races (1917), p.46; The Mytology of All Races (1927), pp., 340-348; WITTKOVER, R (1938-39), pp., 293-325; ÖGEL, B (1971), pp., 441, 541); and had been lived in the various cultural environments and artistic works through the history. See for Asian examples; HOPKINS, L.C (1931), pp., 791-806; WILLIAMS, C.A.S (1960), pp., 136-137; ESİN, E (1972), pp., 44-58, Pl. VII-IX; and also see for examples of different tribes in Europe: HOLMQVIST, W (1961), pp., 145-177, Pl.83-84; WEIGERT, H (1961), pp., 323-327, Pl.176. See for some examples of Turkish-Islamic period; TITLEY, N.M (1981). 6 ÖNEY, G (1969), pp., 171-192; ESİN, E (1970), pp., 161-182; İNAL, G (1971), pp., 153-181; MEINECKE, M (1989), pp., 54-58. 7 PREUSSER, C (1911), pp., 25-26, Pl.36; MEINECKE, M (1989), p.56, Fig.5. One of the door-knockers' photograph taken by Gertrude Bell in May 1909. See: University of New Castle Robinson Library-Gertrude Bell Archive (www.gerty.ncl.ac.uk)/Album /M_095. 8 ÖNEY, G (1969), p.109. 9 ÖNDER, M (1966), pp., 2-4; ÖNEY, G (1969), pp.178-179; ÖNDER, M (1976), pp., 12-16; ERGİNSOY, Ü(1978), pp., 327-330, 440-443. 10 These door-knocker is used as the emblem of David Collection today. 11 TİEM ( 2002), pp., 98-99. 12 ÖNEY, G (1969), pp., 178-179; ÖNDER, M (1976), p.14. 13 ERGİNSOY, Ü (1978), p.440; MEINECKE, M (1989), p.56. 14 MEINECKE, M (1989) p.56; GIERLICHS, J (1993), p.41. 15 DIEZ, E (1946), p.25-note 2; DIEZ, E-ASLANAPA, O (1955), p.23-note.1; MEINECKE, M (1989), p.56. 16 ERGİNSOY, Ü (1978), pp., 327-330; MEINECKE, M (1989), p.56; GIERLICHS, J (1993), p.41. 17 In this manner, it is interesting to be found a dragon figure which its body is knotted on the Jazīra ibn ‘Umar Bridge, dated 1164, between relieves which show the planets. See: HARTNER, W (1938), pp., 114-115-Fig.2. 18 EL-CEZERÎ (2002), pp., 228-233. See also; WARD, R (1985), pp., 69-83; MADDISON, F (1985), pp., 141-157. 19 The similar dragon figures with the knotted bodies like on the door-knockers introduce us themselves on some coins of the Artuqids of Hısn Keyfa (now Hasankeyf) Fakhr al-Dīn Qarā Arslān (1144-1174), Artuqids of Khartabird (now Harput) ‘Imād al-Dīn Abū Bakr (1185-1203) and Artuqids of Mardin Nasir al-Dīn Artuq Arslān (1201-1239) (See: LOWICK, N (1985), pp.170-171; SPENGLER, W.F-SAYLES, W.G (1992), pp., 7-10, 61-64, 122-126; GIERLICHS, J (1993), p.40); and also on a paper from Egypt, dated 12-13th c. (GIERLICHS, J (1993), p.40); a wooden door, dated 1200 (MEINECKE, M (1989), p.54); a gravestone in Cairo that was dedicated to Eyyubids of Hısn Keyfa Turan-Shah (İNAL, G (1971), Fig.3); Aleppo Gate (HARTNER, W (1938), Fig.29); Talisman Gate in Baghdad, dated 1221 (HARTNER, W (1938), Fig.26; (as is known, each of the two dragons which menace the new born child-symbol of the new moon-is represented with wings and the two forelegs); a brass brazier belong to Eyyubid Period from Metropolitan Museum (İNAL, G (1971), Fig.5); a stucco impost from Seljukid Palace at Konya (ÖNDER, M (1976), p.15); a Seljukid mirror (İNAL, G (1971), Fig.7); a bronze votive lamp, dated late 13th-early 14th c. (YETKİN, Ş (1976), pp., 207-214); on the gateway of al-Khān, near the Sindjār mountains (HARTNER, W (1938), Fig.28); a Raqqa plate (İNAL, G (1971), Fig.8); even on the main entrance Khidr Eliās Church (PREUSSER, C (1911), Tafel 3). One of the most remarkable example is a miniature in Kitāb al-Tiryāk from Paris-Bibliothèque Nationale MS.Ar.2964; dated 1199 (NASSAR, N (1985), p.87-Fig.1). 20 "... then I made the rings as they embraced each other and their heads were turned to each other for each wings of the door. Their mouth is open as if they want to catch the lion's head and neck. The lion's head and neck is the extension of the iron nail that was nailed to the door. The teeth of the snake are in two holes in the lion's neck and the ring moves on them…" see: EL-CEZERÎ (2002), p.233. 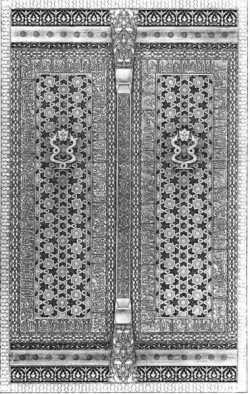 21 An imaginative drawing of the mentioned door have been made as regarding the al-Jazarī's sketch. See: MEINECKE, M (1989), p.57-Fig.6. 22 TUNÇER, O (1981), p.104. 24 This expression that was given by al-Jazarī for the door of the Artuqid Palace is interesting: "its center is formed by the motifs…in the cage style that is made of the flat rods which have finger-like thickness and thicker than them"; see: EL-CEZERÎ (2002), p.228. 25 It is certain that the person who was mentioned as Mahmūd Sanjar Shāh is Al-Mu'azzam Mu‘izz al-Dīn Mahmūd who was one of the Jazīra Atabegs. Since he had ruled between 1209-1251, we can accept the date of 1209 in the door as terminus ante quem. In this case, the bin word which should have been in the name in the door inscription must be missed. 26 TUNÇER, O (1981), p.104; TİEM (2002), p.97. On the photographs of Great Mosque that were taken in 1972, it has been seen that the "alif" and "dal" which were missing in the first word of the inscription frame on the left had been completed (or had been put on their places after they were found) and the "Shah" word which had extended to the frame in the last line had been likely brought upper in order to be reached to the same level because of the frame that was renewed during the restoration of the door. 27 TUĞRUL, B-SUNGUR, F-GÖRKEM, A-ÖLÇER, N (1987), p.106, 108-110. 28 It is determined that the dyes on both sides of the wings of the door were different and had different origins. Ibid, p.110. In accordance with the information that was written on the museum inventory, "in accordance with the remaining traces, the red and blue colors" were used "previously" in the places "where were filled with the rūmi-palmet motifs in the pierced work (ajour)"; TİEM (2002), p.97. When it is examined carefully, it is interesting to find the red color traces which were not known if it was original or not in some places of the dragon figure on the door- knocker in the museum. In 1972, it has been known that the twelve armed stars in the center of the door and inner parts of the isosceles hexagon around of it had likely been dyed with yellow color with an intervention at that date. See: TUNÇER, O (1981), p.104. 29 TUĞRUL, B-SUNGUR, F-GÖRKEM, A-ÖLÇER, N (1987), p.109. 30 It had been seen that al-Jazarī had designed and even drawn such metal ornamental brass-headed studs which he had been described the door of Artuqid Palace as "high and flat dome". See: EL-CEZERÎ (2002), p.232, 230-fig.2.144. 31 In fact, this matter means that Great Mosque of Cizre had been repaired in various times, even this building was converted from the church into the mosque. Likewise, in the middle of 12th century, it was prohibited to establish the new churches in Hisn Kayfa during the period of Artuqid Fakhr al-Dīn Qara-Arslan; even it was not permitted to be repaired the churches; and the churches in Mardin were also transformed into the mosques during the periods of Najm al-Dīn Alpī and Īl-Ghāzī. However, only at Āmid (now Diyarbakır), a largely Jacobite community, were Christians allowed to restore their churches after the middle of the century. See: HILLENBRAND, C (1985), p.13; LOWICK, N (1985), p.168. It is, unfortunately, very late to understand the original plan, structural specifications and architectural elements of Great Mosque of Cizre which was destroyed up to its base in 1945 and opened to praying again in 1990's. But, it may be useful to emphasize this matter: in its photograph that was taken in 1910, the similarity between the door space that is surrounded with the flat lentos and profiled molding which the wooden door wings were placed and the men and women entrance door of a Chaldean Church in Cizre (PREUSSER, C (1911) Pl.35) is interesting and it is sustaining that there is a lion figure which its tail is shaped as the dragon on the stone block on the right bottom of the men entrance door of the mentioned church and even it was found that this same figure had been in a Jacobite Church in Cizre (PREUSSER, C (1911), Pl.34). 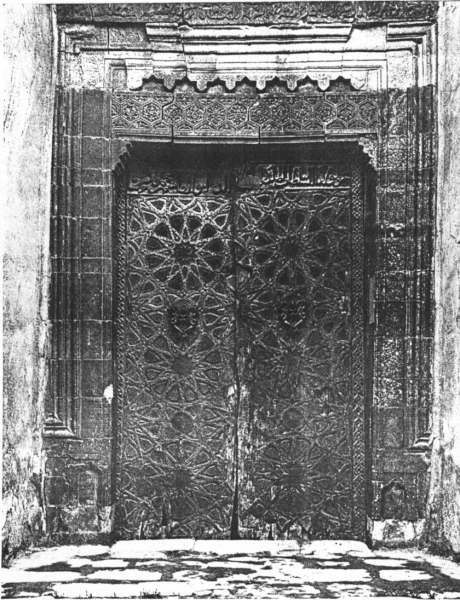 As similar, it is interesting that the decorative stone ornaments on the bordures of the men entrance door of the Chaldean Church had been found on the portal bordures in the east façade of Cizre Great Mosque (TUNÇER, O (1981), p.114-Photo.18). In this connection, one must study much more on the wooden door wings and coloured figural ornaments of Great Mosque which there is less information on it and it is understood that it had been repaired many times. 32 If one says truth, it is expected that such a door must have been made for a palace, not for a mosque. On the other hand, as seen in its former photographs, it is not possible that these door wings open and close without couvre-joint in the middle. The destruction in the joint place of both wings can be seen clearly in the photograph that was taken in 1910. In this connection, there must have been a locking system on the mentioned couvre-joint, this matter explains the function of the door-knockers. 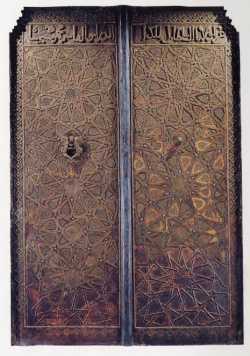 It may be thought that such locking systems have same characteristics with the example, dated 1200-1 which has similar characteristics with al-Jazarī's drawing and it is in the Copenhagen-David Collection. See: MADDISON, F (1985), pp., 141-148. 33 See for remarkable metal artefacts in this collection: FEHÉRVÁRI, G- NASSAR, N (1998). 34 CHARBONNIER, J.M (1995), pp., 50-51. It is declared clearly that the knocker was in Turkey and it is dated to the early of 13th century.